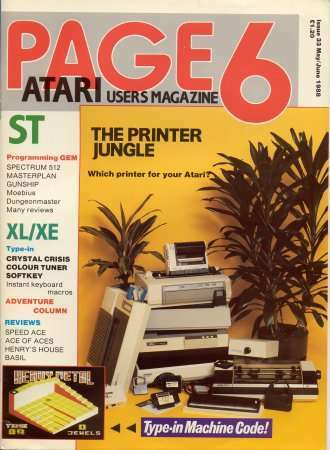 Another of my old magazine games converted for the 5200. I had to create a bigger dead-zone than normal on the analogue stick to make it easier to stop moving. I suspect this will play better with a digital stick. Your mission is to recover the seven lost jewels which have been scattered throughout the deadly mazeworld of rooms that you inhabit. You control a spinning ball-bearing with a joystick in port 1. Move the joystick in the appropriate direction you wish to move. You may climb walls that are low enough and you may also fall off walls, although you'll die if you fall too far! Hold the trigger to put the brakes on and stop your ball-bearing from moving. In each room there may be a number of teleports which will transport you to another location. These are marked by a diamond floor pattern. Simply stop on the transporter then press and release the trigger to energize! In your quest you will encounter a stomping boot, an evil black ball-bearing and a nasty piece of slime. Contact with any of these is fatal. To collect a jewel simply move over it. You have a certain amount of time and your game is over when you run out of time. Getting killed simply costs you time and you'll start that room again. Use START to begin a game at the first location. Use * to begin a game from the last location visited, however you lose any jewels previously collected and so you'll have to go back for them. Use PAUSE to pause, then any key to resume. Use RESET to abort a game in case you get stuck somewhere! This game is incredible!! Thanks again!